Last Thursday was one of the BIG JOB days at the Priory. 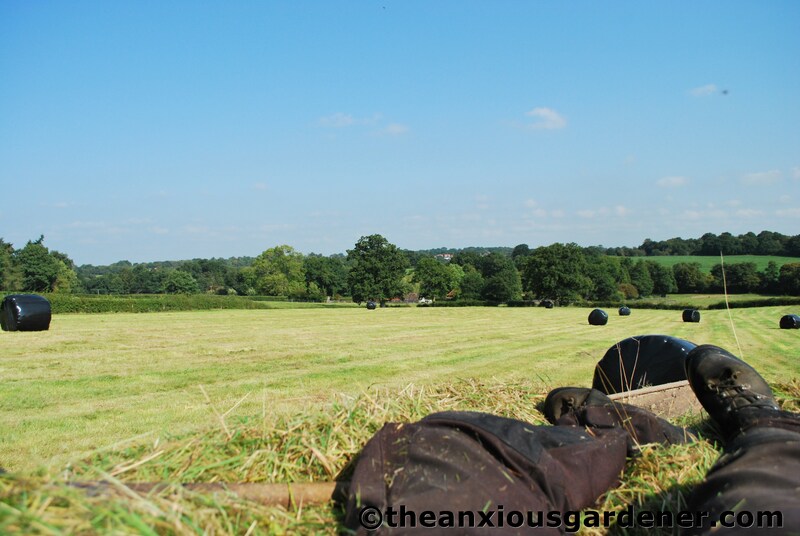 Like the beech and mixed-hedge cutting days (and the eat as many plums as you possibly can before feeling a little bit very sick day), mowing the meadow usually takes at least a whole day and must be planned in advance. It is also, for me, one of the saddest days in the Priory year. 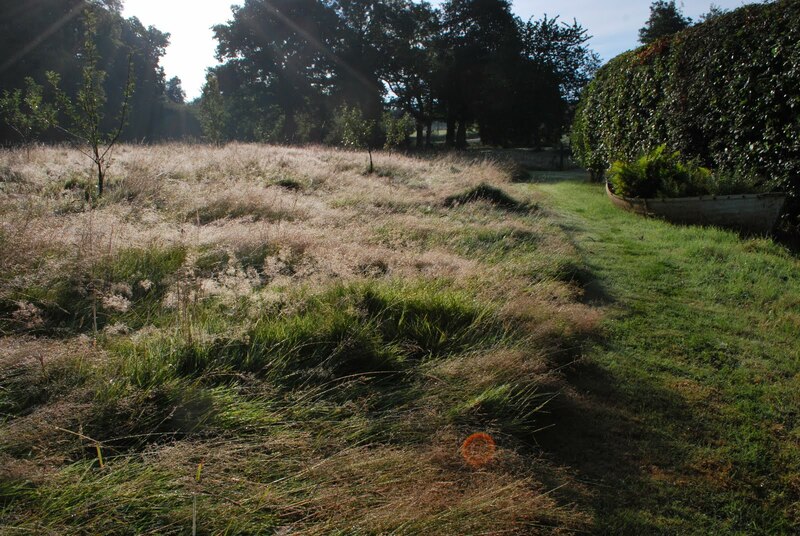 Having watched the grass and flowers grow steadily since the spring, it is always tough to see it all removed in the space of a few short hours. Last year, I had the meadow cut in July – primarily because if left any later, there’s a risk that the long, dead grass will be flattened by summer storms and prove impossible to mow. However, that was before I met Sam and His Amazing Mowing Machine. The grass was getting to a length where it was beginning to flatten and look tired and bedraggled. There will have been plenty of time for flower seed to set and, very importantly, the ground was still firm enough to support big machinery without getting churned up. It was time to do the deed and call Sam. and dumps them into a trailer. The latter was kindly supplied by Margaret (the local farmer) and driven by Nick (who helped me with the hedges). 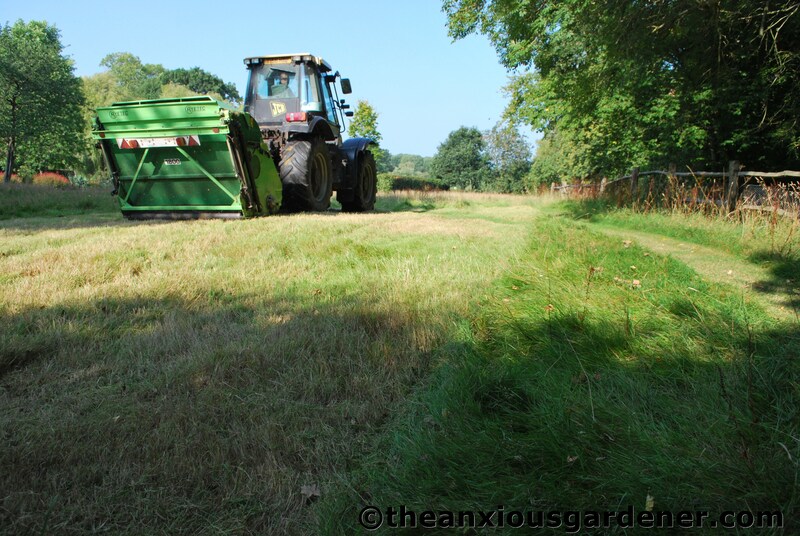 All of the cut grass is removed so as to deplete the fertility of the soil. 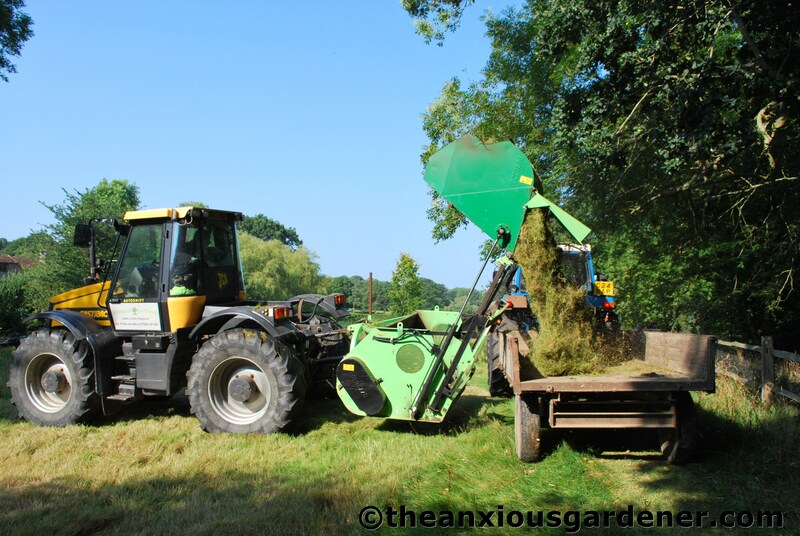 I have no idea how long it will take before the annual removal of all the hay will begin to make a noticeable difference to the growth patterns in the meadow. Five years, ten, twenty? 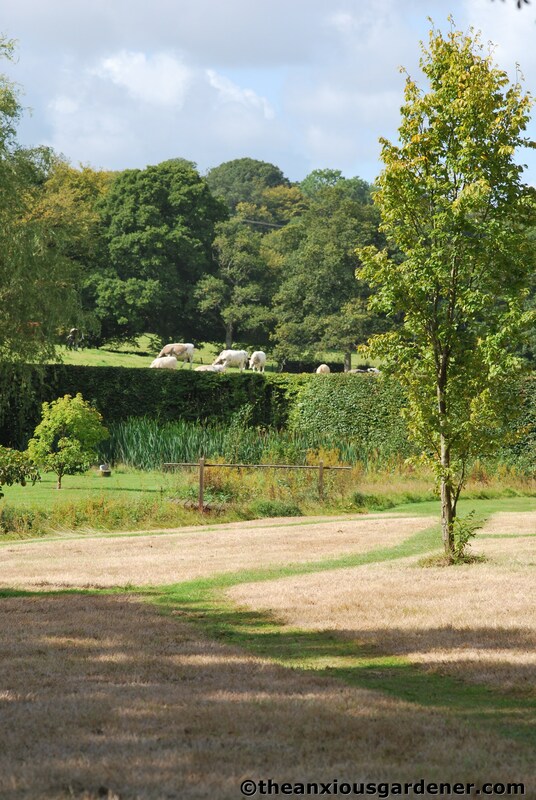 But Sam told me of a client with a similar sized meadow to the Priory’s. 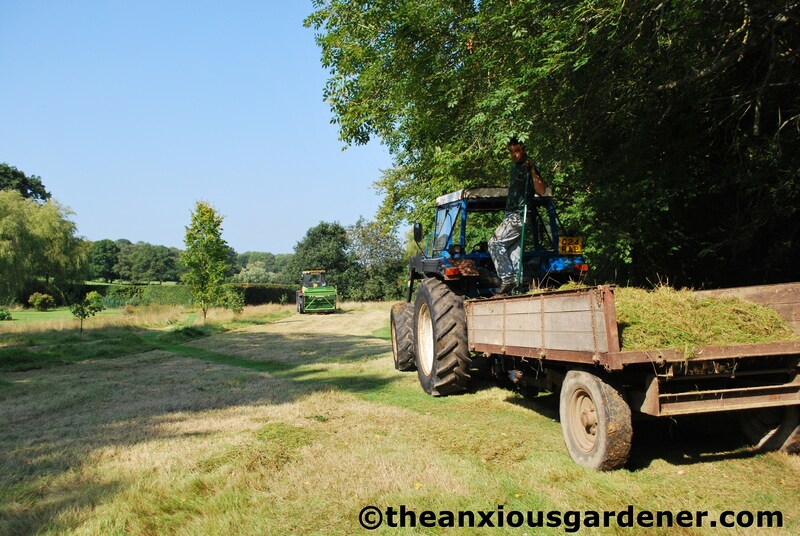 He’s been mowing that meadow for six years and tells me that it is really noticeable how much shorter the grass is now growing over the summer – to the benefit of flowers. 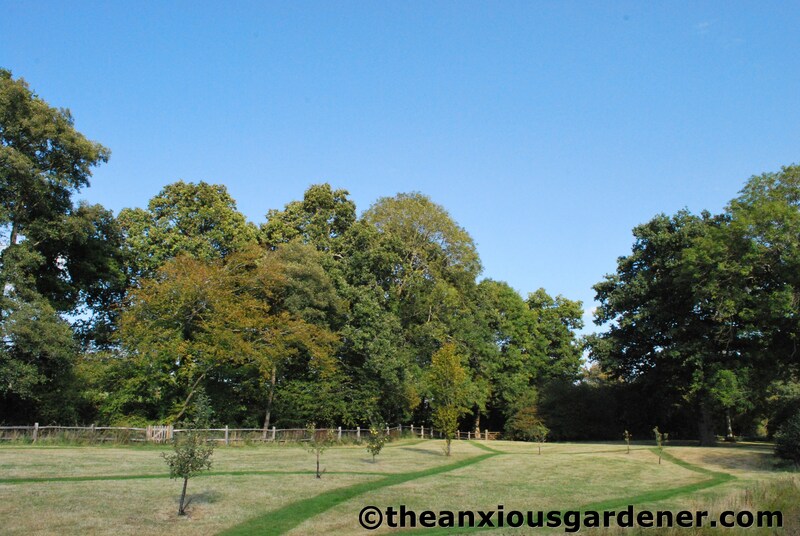 Encouraging news – this will be the third year that the Priory meadow has been mown and the cuttings removed. Hopefully it should start to make a visible difference in just a couple more years. Maybe. The Priory Greenhouse from the trailer. And such a pretty foot! 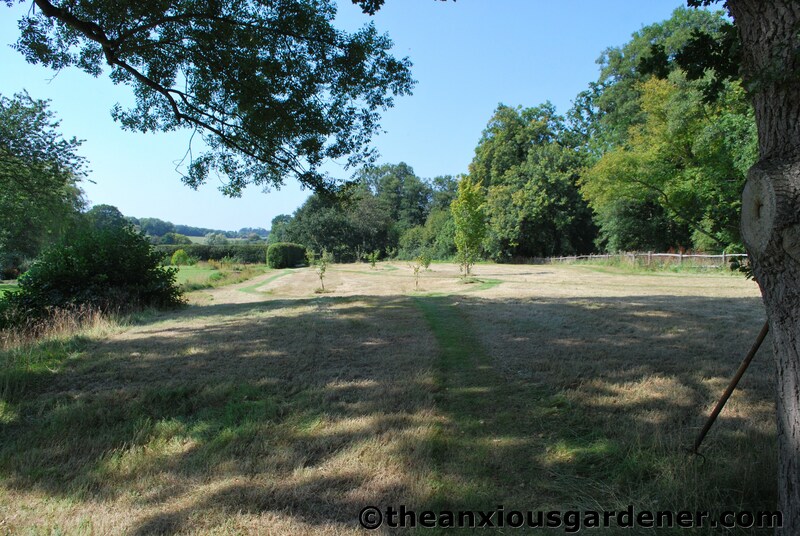 Last year we dumped the meadow cuttings in Margaret’s adjacent field. Her cows enjoyed them for a day before they heated up and started to ferment (the grass not the cows), after which the cows wouldn’t touch them. So, thinking there would be a similar amount this year, i.e. not enough to warrant bailing, Margaret suggested dumping the trailer-loads on her manure pile. Next came the best bit of the day – the drive up to the farm. I travelled on top of the hay in the trailer (trying to avoid lying on the pitchfork ). This was obviously so that I could supervise operations from up on high. Though Nick said it was, in fact, so that my bulk (!) would stop the hay blowing around. 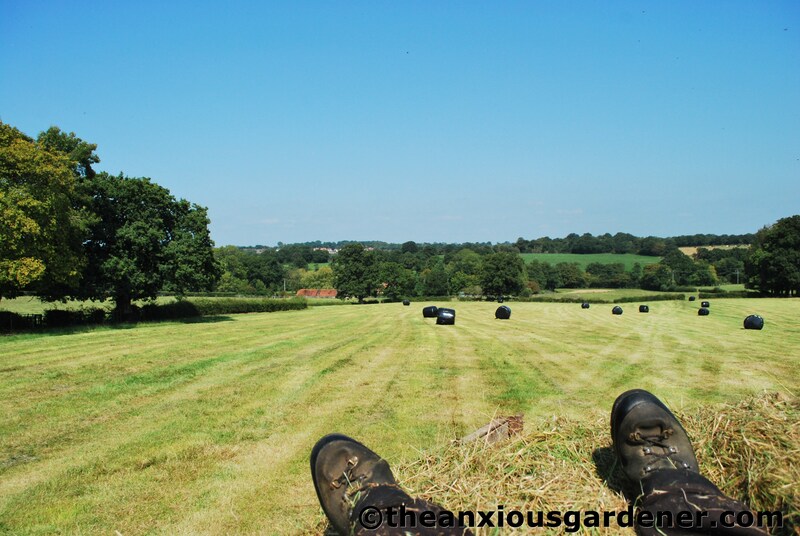 The views from the top of the hay trailer, as we bumped up through M’s fields to the farm, were lovely. And we did it five times! Brilliant. I should’ve charged local urchins £5 each. I would’ve been minted. So now it’s done. 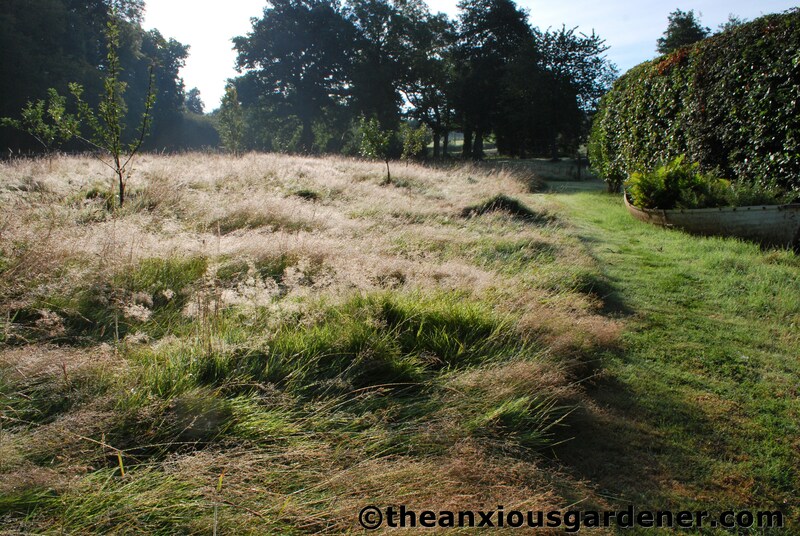 I will need to tidy up with the strimmer and the ride-on and keep the grass short through till next spring. The paths will remain visible for some months yet. And next spring, when the grass starts growing, and with the emergence of the first daffodils, the whole process will start again. Can’t wait …. Thank you re the feet, Janet. I've often been told that those and my elbows are my best features. Er, I may have misled re open-sharingness of Priory-Land. Whilst Margaret did indeed lend her tractor and trailer, Sam and his gear (and Tim) were hired in for the day. There is a mowing machine for going up a steep slope, Mr K, it's called you-with-a-strimmer. You've upset me big time with your observation on how long it takes for the meadow grass to become stunted. And no, 'fraid not. We're on clay at the Priory – so who knows how long it's going to take! Sulk. Jason, I had no idea you were such a soft ha'porth (no offence – smile)! Anyhow, I'm so jealous at you going to Granada, I can barely speak to you …. Hi Boys, funny innit? What I long for at the moment is a city break. Somewhere bright and happening with lots of coffee shops, bars, galleries and shops – ideally where they don't mind my muddy wellies! Hi Alberto, you're very welcome! Hope you hang around …. Karen, pleased to make you smile. Sorry for the melancholia and though it isn't strictly my fault, I apologise for you still waiting for a summer that never came. Ho hum – soon be Christmas. When supervising Jane, I'm carried about the Priory on a golden litter, fed peeled grapes and fanned with ostrich feathers. Hence the horizontal shots. I hadn't appreciated the barreling of seasons into one day, Stacy, but you're right. I suppose by putting off the meadow cutting for so long, I was also trying to delay the inevitable dive into Fall (it seems only right to use your word when you've been so polite to use mine). Wonderful post – it made me smile and feel melancholily at the same time – Autumn is nearly upon us (Even though I am still waiting for summer) and yes the whole cycle starts again … thank goodness. Shame for the meadow, it was so nice in the first picture! Stuff that needs to be done though. I found your blog thanks to Kininvie's ping and I think it is very interesting, will stay tuned. I agree, lovely feet, hehe! That's a serious piece of machinery there, which must be fun to use. 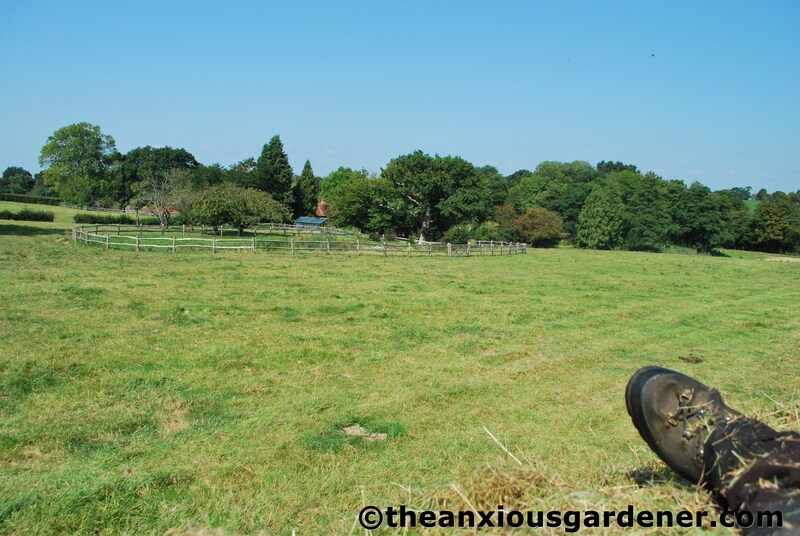 And seeing so much space and greenery (and grass being mown) is 'refreshing' to watch, especially from city gardeners like us. 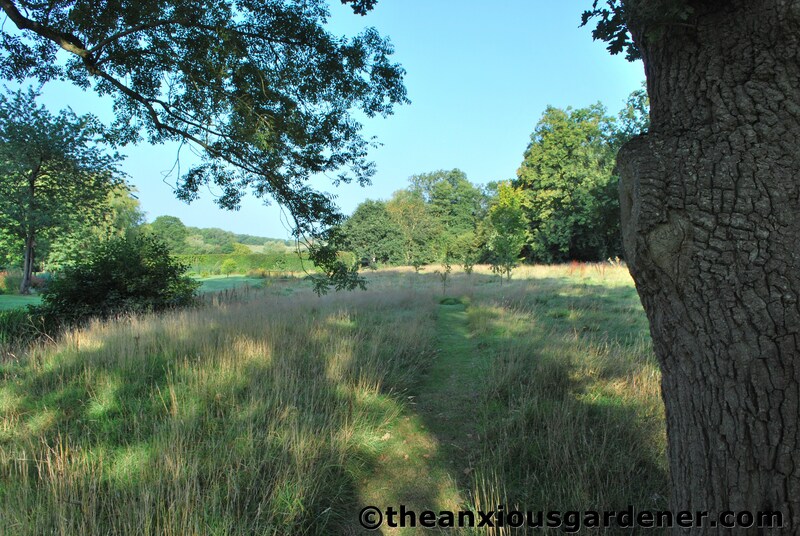 Can't wait to see how the the meadow will look like next year, full of flowers again I hope. I understand your sadness in mowing the meadow; it is one of those markers that indicate that autumn is with us and that the year is winding down. Still, as your post concludes, it is a cycle and what is missing now will be back next year. I agree with Janet that having that community of support must be a wonderful thing … it brings a sentimental tear to the eye! If only they made mowing machines that could go up a really steep slope, how happy I would be! I have to say that it took a lot more than six years to reach the stage where the thick grass on my bank thinned down. It all depends on the soil I suspect, and if, as I assume, you have underlying chalk, it may happen a lot sooner. Can't wait to see the meadow next year, should really be getting good, though I have to admit to loving it even when mainly grass.